Turns out there are still real old fashioned cowboys out there. I found this out after a few days of packing food for a thru hike of California’s John Muir Trail up in Mammoth Lakes. Labor Day at Strawberry Music festival had ample good food, great people, foot stomping bluegrass and whiskey and a bit of fly fishing. Unfortunately Monday brought the reality of the fact that my friend David and I were about to undertake the roughly 200 mile JMT. Both of us grew up outside and have taken that passion into the form of jobs. David had led trips for NOLS in Alaska all summer and I just wrapped up guiding sea kayaking trips in Washington’s San Juan Islands. However, as great as those jobs are we were both feeling in need of a good personal trip and a chance to catch up on trail. 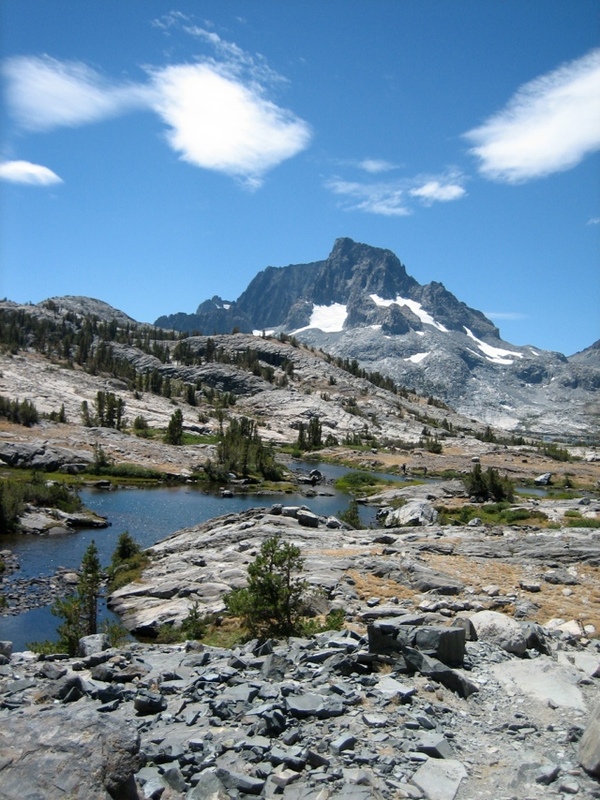 By far the finest stretch for this is the high alpine JMT. Calculating and purchasing rations in Mammoth took a few days, and we did so in comfort and style with my dad who is a former crusty Sierra rat and once spent years exploring the area’s peaks and meadows and is directly responsible for me being a mountainholic. After dialing in our food and gear it was time to drop some re-rations. The first was close by Mammoth at Red’s Meadow went quickly and consisted of paying $6.00 and dropping our food. The next, at Rainbow Pack Station out of Bishop was where I encountered “Parcher’s Pete” and a new found understanding for the seemingly forgotten American cowboy. When my dad and I pulled up in our truck, there was a man sitting outside of a stable storage shed. Pete had an American Spirit hanging from his lip, a few days of blonde stubble and a boot on one foot and the other bare with dirty Levi’s rolled up with a jean shirt tucked in. When we pulled up he jumped up saying “howdy” and flicked his cigarette. A nearly empty bottle of Evan Williams was on the porch next to a small stereo that played blaring Irish punkgrass. “Let’s see here,” he said and put an Adidas sandal on his bare foot. He asked us to grab our food, which we had stored in Tupperware boxes, and put it on the porch. By this point we noticed just how hammered Pete really was. We later found out that this was his first day off since June which he was celebrating by getting thoroughly pickled. Pulling out a tied loop of cord, he grabbed his near empty bottle of whiskey and passed it to my dad who gave up his drinking days long ago. Putting a grimy thumb in the bottle with the chord wrapped around, he did a fancy hitch and pulled it free. “I’m a master of hitches and knots,” he proclaimed stumbling. I believed him. Heading into the wood office, I noticed that they had a kitchen with all sizes of cast iron pots and pans. It looked a lot like a cliche country home. Fumbling through clipboards, he kept pulling up names like “Ralph” and asking if it was us. Either he couldn’t read or the whiskey was making him cross eyed. At some point, Pete picked up the phone, answered “Rainbow Pack Station,”had a brief conversation and then dropped it on the ground. It began an audible dead line sound after a bit. At this point I was skeptical that we would be getting our food, but Pete would gain my trust momentarily. After writing a note to Pete’s boss, we stepped outside, he offered me a slug of whiskey, I accepted and then he asked for a ride into town to get some Copenhagen. My dad’s truck was full with stuff from labor day and mine and David’s paddle gear from the summer so he sat in the back near my road bike. He tried to sit on it at first. I was impressed after I asked him not to when he sat on a bucket. “That’s a nice bike you got there,” said Pete. “I do some road races,” I replied shouting back to him. He immediately yelled with a smile, “I once rode a horse from Minnesota to the Oregon coast!” My dad and I looked at each other and laughed, not sure whether to believe his claim or take it for a tall cowboy tale. At one point his hat blew off and he had us stop real quick to get it. “An Irish cowboy without a hat isn’t much of a cowboy at all.” He ran down the road difficultly in his stirrups. We pulled up to his destination-the liquor store-and said goodbye. “See you on September 16,” I said very clearly. “What kinda beer you drink…Sierra Nevada?” Pete asked. “I’ll bring it to ya at the pass!” I was skeptical he would remember, but grateful for the prospect of having a beer at 12,000 feet after ten days of walking in the Sierras. The classic cowboy does still exist. Ha. Such a great story!!! Great story…you really capture the essence! Hahaha Andy this story is hilarious, sounds like a fun time!